Members from EdPolicyWorks, a research center examining educational policy and the implications for the workforce, descend on Washington DC for the annual fall research conference of the Association for Public Policy Analysis & Management (APPAM) this week. The 2018 conference theme is Evidence for Action: Encouraging Innovation and Improvement. APPAM is a multi-disciplinary annual research conference for the highest quality research on a wide variety of important current and emerging policy and management issues. Researchers from EdPolicyWorks will be presenting their work in over 25 key presentations across the conference. 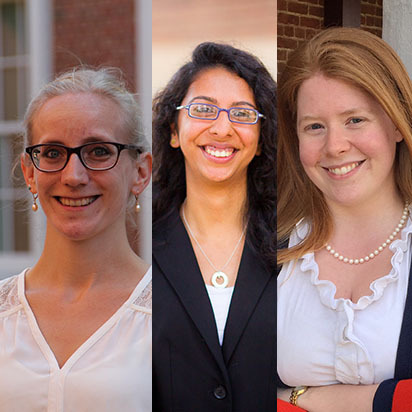 Four UVA Ed Policy job market candidates are presenting including Anna Markowitz, Jessalynn James, Katharine Meyer and Aliza Husain. Jessalynn James, a Ph.D candidate in Ed Policy, will be presenting a paper on “Teaching to the (Common Core) Test: Causal Effects of a CCSS-Aligned Assessment on Teachers’ Practice” during a session on the effects of district, state, and national policies on academic performance. UVA Ed Policy student, Kylie Anglin will also be presenting during this session on the impact of deregulation in Texas Public School Districts. Another Ph.D candidate, Katharine Meyer, will be presenting her work on “Lessons from the Library: Leveraging Public Institutions and Behavioral Insights to Improve Adolescent Outcomes.” She and her faculty mentor Ben Castleman will be part of a larger session on leveraging behavioral insights to support parents' engagement in children's learning. Highlighting the breadth of topics covered by UVA Ed Policy researcher, Aliza Husain, also a Ph.D candidate, will be sharing her research on “Evaluating Principal Quality in District of Columbia Public Schools.” This session on evaluating principal quality and measures of effectiveness also includes other research on principal leadership and student learning. Additional EdPolicyWorks researchers presenting at APPAM include faculty and staff members Luke Miller, Peter Youngs, Sarah Turner, Vivian Wong, Daphna Bassok, Katharine Sadowski, Kate Miller-Bains, Julie Cohen, and Veronica Katz, as well as graduate students Emily Wiseman, Justin Doromal, Anandita Krishnamachari, and Zach Sullivan. The annual fall APPAM research conference is from November 2-4, 2018.